It was a round four in the Thursday’s club, I had Black and played Queen’s Indian Accelerated again. My opponent was a boy, never played him before. The first interest moment came when he suddenly played 19. Ne6. I looked at it and realized that accepting it would be bad after 19… fxe6 20. Qe7 Rf7, so decided to decline it, but spend some time thinking about the right reply. I considered 19… Ne4, but didn’t see any advantage in 20. Nxd8 Nxd3 21. Qd2 missing that after 21… Rxd8 22. 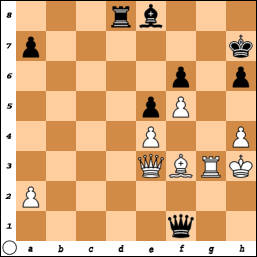 Qxc3 Qc6 White has to play 23. e4 because 23. Qb2 or 23. Qc2 is met with b5. Another line 19… Ne4 20. Rd3 Rxd3 21. Qxd3 Qe7 22. Bd5 Nf6 23. Bxb7 Qxb7 24. Ng5 is -0.80. Instead I played 19… Rd6 and in a few moves got some pressure on “d” vertical. But after 24… f6 Black’s position also became vulnerable due to the weakness of a2-g8 diagonal. My 32… d3 sacrifice was not necessary, instead Qd8 was keeping the pressure and defending the kingside at the same time. After 35 moves I had about 3 minutes left. I saw that Rxh6 was possible and wanted to defend, but didn’t have enough time to calculate properly and played Rd7. It was a mistake, 37. Rxh6 gxh6 38. Qg6+ Kh8 39. Qe8+ Kg7 40. Qxd7+ Kf8 41. Qd8+ Kg7 42. Bc4 was winning. Luckily for me he didn’t see it. I stopped writing the moves at that moment, remember playing Qf8 on the next move, so Rxh6 was not possible anymore. Then I created again a pressure on e4, he made a mistake and was forced to give up his “b” pawn. In the end we had the following position, where I repeated the moves. This position is equal after Bg2. It was a first round of a new tournament in Monday’s club. My opponent was an old guy, he told me he didn’t play in 25 years. Yes, he looked rusty sometimes, nevertheless played pretty well. So, I had Black and played Queen’s Indian Accelerated. His 31. Qg2 was not the best move and then 32. bxc5 increased my advantage. So, I won a pawn and tried to get a breakthrough in the center. 36. Re4 was better than Red7. In the end I got under 10 minutes and he was under 20. I started to feel exhausted and not seeing a way to win, decided to offer a draw. He accepted.